ARCHERY (TICKET) – Do you think you could be the next Brian Boru? Then come along and take part in our Arrow making workshops which will run from 2pm – 6pm. When you have mastered the art of arrow making, then have a go at one of our Archery shooting ranges. Archery shooting ranges are open to both adults and children. Archery is one of the oldest precision sports still practised today. Its origins date back to prehistoric times when the bow and arrow were used to hunt for food. If you think you have what it takes to be an archer then come and have a go. 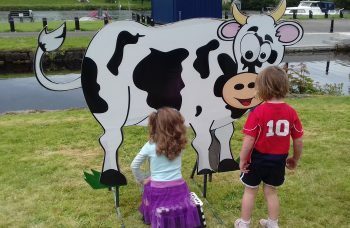 Coconut Shy (TICKET); Hoopla (TICKET); Tin Can Alley (TICKET); Giant Chess; Skittles; Giant Connect 4; and Milk the Cow. TRADITIONAL CRAFT EXPERIENCE (TICKET) – Try your hands at some copper craft under the experienced tutorage of Mark Wilson & team. Some of these copper pieces will be used in the Féile Brian Ború 2018 sculpture due to be unveiled in August 2018. Workshops will run throughout the day and anyone can take part. A great, fun experience for all the family! Everything you need to know about creating floral arrangements that reflect the seasons and the beauty of the natural environment. Learn the basics of making your own flower crown. Come along and learn everything you need to know about floral arrangements on a budget. Suitable for Adults & Children. Co-ordinated by Meadowsweet Flowers. FUNNY PHOTO BOARDS – Did you ever wonder what you would look like as one of Brian Boru’s soldiers? Come along and take your photo at one of our funny picture boards. Don’t forget to upload to your Facebook page and tag @feilebrianboru. Traditional Family Fun Day sponsored by McKeogh’s Hardware, Reddan’s Bar & Whelan’s Newsagents & Foodstore.